Realtime Gaming has been developing new mobile casino games as quickly as they can and this month they've introduced two video poker games and a spooky slot game perfect for Halloween. Slotastic added Joker Poker and Bonus Deuces Wild video poker and the Voodoo Magic Halloween slot game this week. These games have been popular in the online casino for awhile and are now available to players that prefer to play on their smartphone or tablet. Voodoo Magic features a spooky Wild Priestesses and scattered Voodoo Dolls. You'll get up to 25 Free Spins with a Magic Multiplier with any scatter win. Magic Multiplier prizes increase with each Free Spin! Voodoo Magic mobile slot and Joker Poker and Bonus Deuces mobile video poker added to Slotastic Mobile Casino. Jokers turn mundane hands into royal winners in the new Joker Poker. The new mobile video poker game features a payout for Sequential Royals that will send players giggling all the way to the bank. In Bonus Deuces Wild, deuces are wild and special payouts are given for five-of-a-kind hands and four-of-a-kind deuces. In both games, players can play 3, 10, 52, or even 100 hands at a time. After a winning hand, they can choose the optional Double or Nothing Bonus and try to double their win by selecting a card that is higher than the dealer’s card. 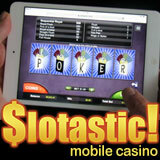 Once a month, Slotastic Mobile Casino players can get a deposit up to $444 doubled. To receive this bonus they simply enter coupon code GOTASTIC when making a deposit on their smartphone or tablet. Slotastic has hundreds of games from RTG including several Halloween slots including the new Witch’s Brew. If you're looking for a spooky experience, try Eternal Love, Count Spectacular. Voodoo Magic, Goblin’s Treasure or Haunted Opera.